They are the names of the victims who were killed on 7 July, 2005 when the double-decker bus exploded near where the plaque stands today. The beast who took away these lives was a brain washed 18 year old from Leeds. For the families of these victims who were from different races, ethnicities and religions. Laying the wreath by the plaque, I read the 13 names. Each name represented a life which was interrupted suddenly. They could have been with us today and we could have been one of them on that day. This is a fight between good and evil. A fight between those who cherish the miracle of life and those who glorify death, but also a fight which has become harder by the meddling of the treacherous spineless politicians who simply can not stand up to this evil and do-gooder 'useful idiots' who always find ways to justify and appease these wicked monsters. Rest in peace my brothers and sisters. We need to shut down radical mosques. Wake up, Western world...these radical mosques would not be allowed to operate in most of the Moslem world so get with the program. So how about the Iranian victims of 7/7 bombing? A woman of Iranian background died in that attack too. I didnt see her name in your list. 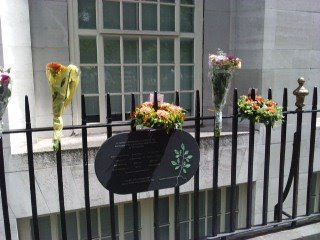 This was the victims of the bus explosion at Tavistock Sq. The plaque includes the names of the victims who died on th ebus explosion. The rest were killed in the underground explosions at other stations.